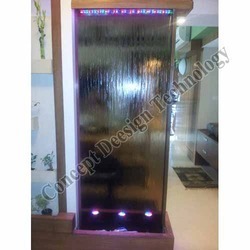 Our range of products include glass water curtain, string water curtain, glass curtain with led lights, string water curtain with acp sheet and glass water fall. Concept Design manufactures and exports a wide variety of indoor fountains. Glass fountain helps in enriching the inside area with enticing water sound that varies from garrulous waterfall to chattering stream. Attractive in look and innovative in designs, these are fabricated using latest technology. Our designs are highly durable and reliable in nature. 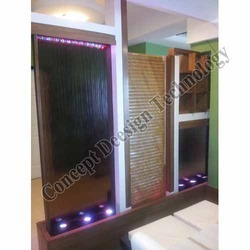 In addition, these are widely used in multi national companies, hotels and spas. 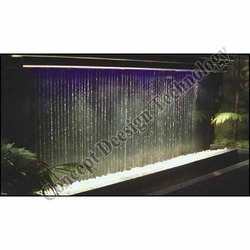 Our company proposes a wide assortment of indoor fountains like glass water curtain effects to our valuable clients. The team of our company proposes a wide assortment of indoor fountains to our valuable clients. 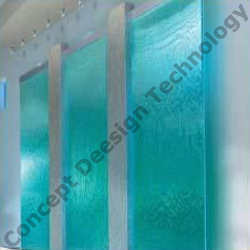 Concept Design offer automatic Water Curtain in varied patterns and effects. These can be automatically started and shut off as per the requirement of clients. We can aptly team them with DCC lights to have a beauteous effect. 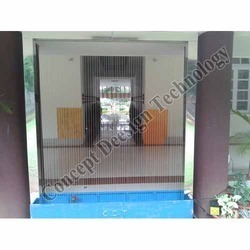 Water curtain can be installed at the main entrance of building, sidewalls, adjoining glass windows, adjoining pillars or at the center of a hall. 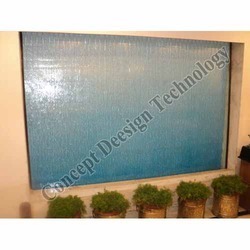 They are available in different forms like programmable water curtain, wall water fall curtain, glass water curtain. Looking for Indoor Fountains ?